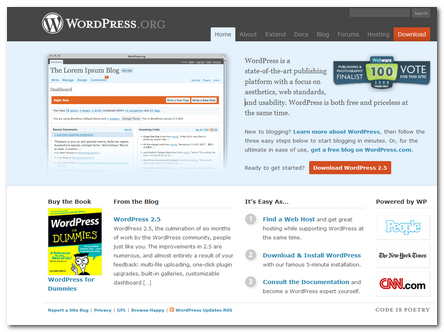 You are here: Home » WordPress 2.5 is here! ← How to Manually Update Chrome Extensions? I have been really looking forward to WordPress 2.5 and is here now. I will be writing up a review of the new features this week but if you are already curious, Matt Mullenweg has written a great write up about WordPress 2.5 new features here. One of the big changes is the new WordPress admin interface and you can watch a 4-minute screencast of it. Also, I am loving the new WordPress.org re-design. Don’t you? The new wordpress.org does look pretty awesome but I probably won’t update to 2.5 for at least a week or so, just to make sure there are no bugs that would break anything I use. I usually don’t wait to update wordpress but I have had some issues with updating too quickly with other apps and have made the decision to wait a bit from now on.